As our country becomes less heterosexual focused and more understanding of homosexuality, bisexuality, and transgendered individuals, it’s important to remember bigotry and hate still exists. As a result, many people in the LGBT community develop issues with depression, anxiety, isolation, and low self-esteem. This is of no fault of their own, as many are victims of abuse, abandonment, and prejudice. Look at it this way, even as we celebrate such historical advancements as The Supreme Court’s decision to make gay marriage a constitutional right, a significant percent of the country views the LGBT lifestyle negatively. Further, some individuals and groups choose to make their disapproval vocal, often in a hateful way. Many in the LGBT community lack a consistent support system, which results in a feeling of being alone or unaccepted. This lack of familial or religious support makes it all the more difficult for those in the LGBT community, especially children and adolescents, to face tribulations such as bullying and depression. Sadly, many LGBT individuals grow up hiding their real feelings, which inhibits their ability to be happy. The ubiquitous bigotry in our country has a significant effect on LGBT youths. Even if an individual has supportive relatives, the cruelty of bullying can leave deep scars that last into adulthood. As previously stated, many in the LGBT community continue to struggle with scars and traumas from childhood. Even if an individual has come out and found a supportive community, the memories of bullying, abandonment, and isolation remain. For this reason, many LGBT people seek the help of therapy to come to terms with and resolve tribulations from their past. Further, if you’re confused about your sexuality, a therapist can offer a safe, comfortable space for you to discuss your feelings without any fear of prejudice or judgement. What many need is a trusted ear in which to talk. 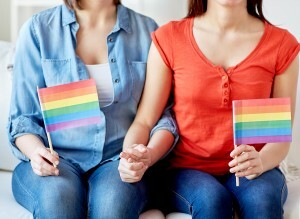 Even if an LGBT individual comes from a supportive family, they may still need someone to open up to about the effects of living in a not-so-accepting society. Feeling safe and open to discussing one’s childhood traumas, depression, and relationships can only happen in an accepting environment. That’s why we here at West Hollywood Psychology have established a friendly environment focused on helping our clients. Our therapy sessions are tailored to your specific needs, and provide a comfortable and open environment to foster communication and growth. Therapy begins with understanding you and your concerns. Don’t spend another week, month, or year bottling up your feelings and hiding your scars. It’s time to take control of your life and start being happy. With the help of therapy, your confidence and self-worth will grow, resulting in a more fulfilling approach to life and healthier relationships. If you’re interested in participating in or have any questions or concerns about LGBT therapy in West Hollywood, feel free to contact us. For more information on our approach to treatment, visit our “therapy” page.